This kit from Stampin' Up! 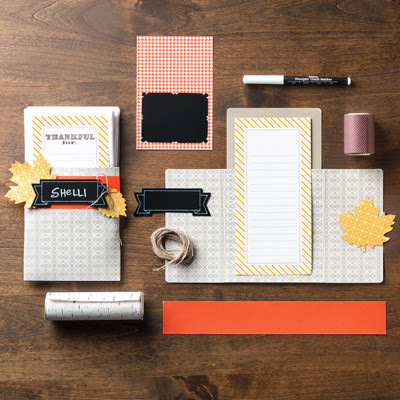 has enough materials to set the mood for 10 dinner guests: napkin holders, table tents, centerpiece wraps and accents. The supplies can also be used for many different projects as well as for making cards which is what I did. This card was quick and easy to put together because everything was already done for me - almost. I cut the background pieces to fit my card base and then added the elements. I stamped the chalkboard piece with happy birthday, put two dimensionals behind it and placed it on the card. The last element to add was the pre-cut leaf and a bow made from the linen thread in the kit. Voila! I gave this card to my daughter in-law for her birthday. 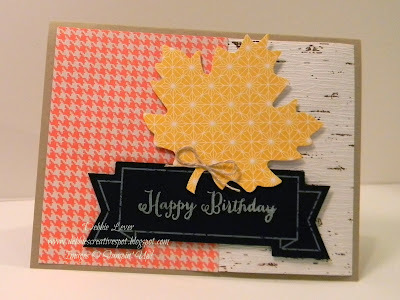 This is also one of the cards we made in my recent Birthday Card Class. HUGE Sale with 24 Hour Doorbusters!